Now, Copenhagen-based design and planning firm BIG (Bjarke Ingels Group) has just released a proposal that provides the latest evidence of that dynamic at work. 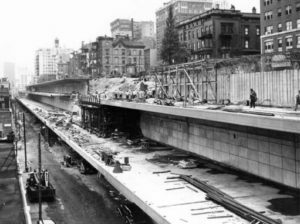 BQE under construction in the 1950s. The Brooklyn Queens Expressway (BQE)—built by the notorious Robert Moses in the 1950s—is an iconic piece of New York City infrastructure that has accommodated car and truck traffic for more than 60 years. 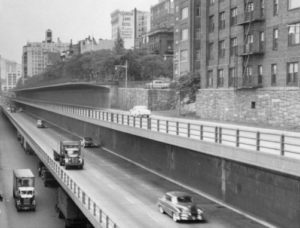 While admittedly a marvel of good engineering, it was also a marvelously-bad example of planning, catering solely to the needs of automobiles. Moses specialized in shutting the city off from access to its waterfronts, and was equally focused on paving-over neighborhoods comprising low-income, immigrant and/or people “of color.” A large percentage of New York City’s revitalization opportunities reside in undoing his work. As the triple-cantilever structure along Brooklyn Heights shows signs of corrosion and aging, New York City has taken on the challenge of repairing the roadway, spanning from Sands Street in the DUMBO (Down Under the Manhattan Bridge Overpass) neighborhood to Atlantic Avenue in Cobble Hill. The newly-opened BQE in 1954. 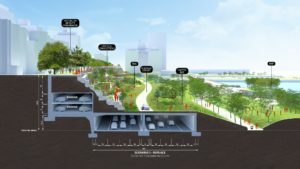 Constrained by limitations of working within DOT jurisdiction, official proposals so far have been limited to re-building similar conditions – aging roadways replaced by new roadways, temporary and permanent, which would continue to act as barriers between the Brooklyn community and its waterfront. 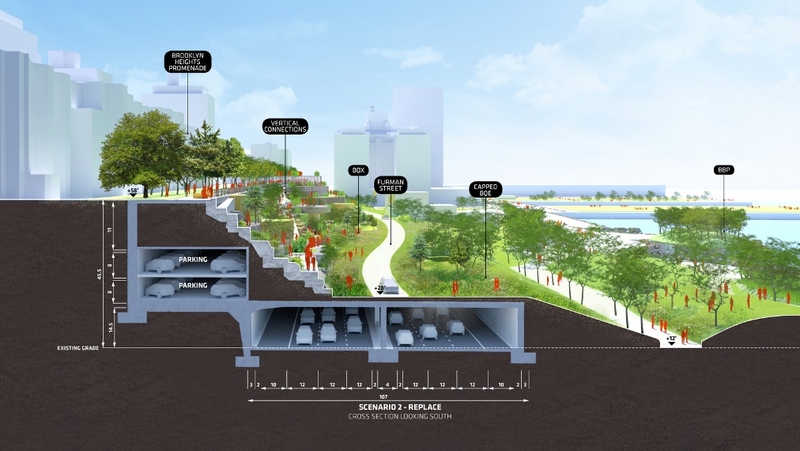 Inspired by the opportunity to work in their own backyard (BIG has a local office), BIG has developed an integrated proposal they dub BQP: how to turn the BQ-Expressway into a BQ-Park, while still accommodating significant vehicle flows along the route. Construction of an at-grade roadway along Furman Street and Brooklyn Bridge Park, covered with a simple deck structure, is the first step of a waterfront transformation. This deck provides a platform for adding significant new parkland along an underused corridor, while connecting Brooklyn Heights to Brooklyn Bridge Park with a preserved or re-constructed cliffside – criss-crossed by rampways, greenery, and park amenities. Local park access is accommodated on a meandering parkway, while space is created for a potential spur of the BQX light-rail line. The deck structure extends south to Atlantic Avenue – where it creates a new crossing and urban nexus, and the beginnings of a linear park which could eventually connect DUMBO to Red Hook. 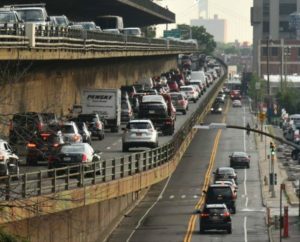 The simple structural approach, and one-time construction of the new roadway, create a more feasible and less costly solution for reconstruction of the BQE, while delivering far more benefits to the community. 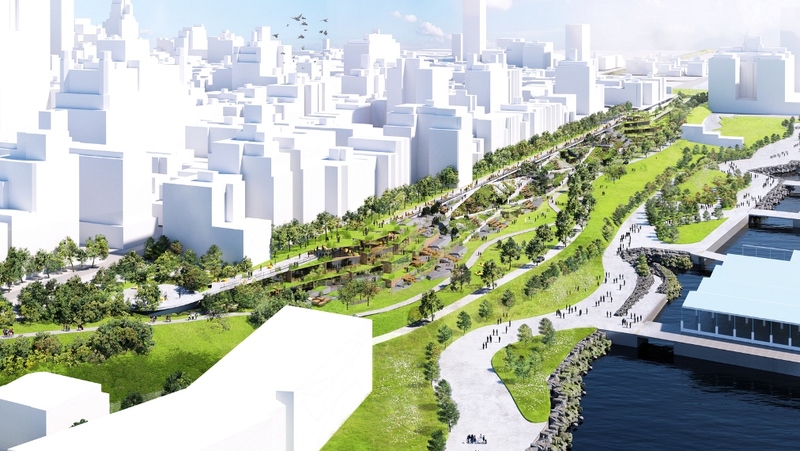 The result is a condition more reminiscent of Brooklyn Heights historical conditions – where city and river interlaced seamlessly, prior to construction of the highway. With this proposal, BIG is hoping to build on the great waterfront revitalization work that has already been accomplished—and is currently being undertaken—in Brooklyn to think proactively about the problem of undoing some of the 20th Century’s worst urban planning. Renderings courtesy of BIG. Historic photos courtesy of NYC DOT.